How do solar streetlights differ from their grid-tied counterparts? Solar streetlights are entirely self-contained, making them ideal for isolated locations, without all the costs of cabling and grid connection. Also called photovoltaic or PV streetlights, they’re quick and easy to install, with no earthwork or trenches needed, so the range of possible applications is virtually limitless. The key difference between these two kinds of public lighting is their power source. Solar streetlights use renewable energy. And because solar energy is free and will never run out, PV streetlights are an ecologically friendly, cost-efficient and completely autonomous solution. They’re a perfect fit with the energy transition led by the French government. Solar lighting also offers better availability, since it’s not affected by power outages. How does a solar streetlight work? The solar PV panels on top of the pole capture the Sun’s rays, turn them into electrical energy and store it in our NiMH (nickel-metal hydride) battery system, with Power365 technology. Then as the Sun begins to set, the built-in dusk sensor tells the streetlight to switch on. The level of lighting power is preadjusted as part of the project to meet the specific requirements of each customer. For example, it can be set to produce brighter lighting at nightfall and in the early morning, with a lower level of illumination in the middle hours of the night to limit light nuisance and pollution. Fonroche solar streetlights provide guaranteed lighting 365 nights a year, whatever the weather. Do solar streetlights keep working in bad weather, or if there’s no sunshine? Fonroche solar streetlights are adapted for all types of environments. At the start of each project, our experts carry out a local study. Our off-grid streetlights are then ‘right-sized’ to match the solar potential of the geographic location. In other words, they’re specially designed to work perfectly in even the most extreme configurations. Plus, our solar PV panels, with their large capture area, keep producing energy throughout the year, even when sunlight levels are low. And coupled with our Power365 battery technology, Fonroche solar streetlights provide guaranteed lighting 365 nights a year, regardless of prevailing weather conditions. The battery system, with its smart programming, constantly monitors the level of charge and supplies the necessary power accordingly, so it never runs out. Thanks to this anti-blackout system, there’s always enough charge left to provide illumination in poor weather conditions, even for extended periods. This picture shows some of the solar streetlights we’ve installed in Calais, in the north of France. Fonroche solar streetlights deliver powerful illumination in all parts of the country. They never go a day without being able to recharge. Even when it’s overcast or raining, they’re always charging and delivering power! 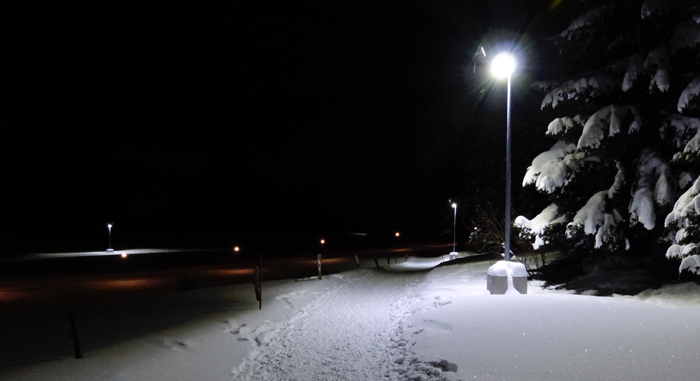 Are off-grid solar streetlights suitable for extreme climates? The poles we use for our solar streetlights are designed to withstand the most extreme climatic conditions, including the highest wind loads, in compliance with the European EN40 standard. Our Power365 battery technology can put up with temperatures from –40°C to +70°C. Plus, our French-manufactured solar PV panels are specially developed for all types of conditions, including high winds, snow and sandstorms. These design features make our off-grid streetlights the ideal public lighting solution for all types of projects and environments. We’ve installed solar streetlights for businesses high up in the Swiss Alps. We’ll soon be installing hundreds of our Smartlight off-grid streetlights along a 20-kilometre stretch of road in one of the hottest parts of the globe, where temperatures average 47°C and reach 65°C to 68°C in the summer! How are Fonroche solar streetlights manufactured? - a pole and crosspiece, designed to withstand the highest wind loads and with optional surface treatment for projects where corrosion is an issue. Every Smartlight solar streetlight manufactured at our Lot-et-Garonne plant in southwest France undergoes stringent quality control before being shipped to locations in France or around the world. On-site installation is quick and easy, taking less than two hours. Once installed, it’s immediately ready to use. 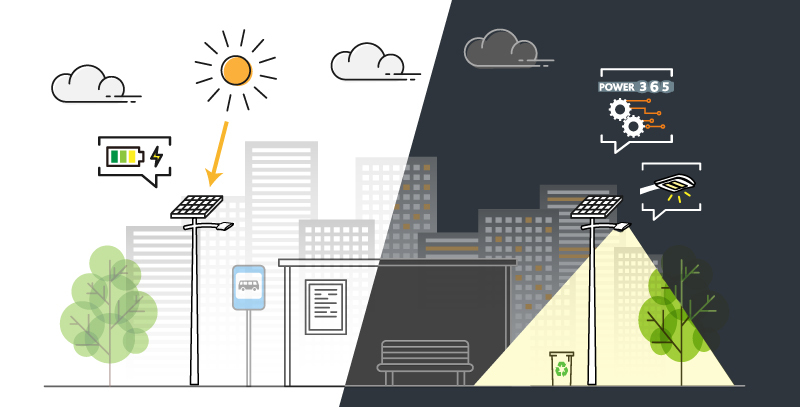 How much does an off-grid solar streetlight cost? A solar streetlight costs about 10 to 20% more than a conventional streetlight. That’s because, unlike their grid-connected counterparts, our solar streetlights incorporate a host of clever technologies, including a smart energy management system, which is fully programmable for powerful off-grid illumination. Over time, solar solutions are proven to be much more cost-efficient than grid-connected lighting. Installation of a PV streetlight doesn’t require any major work, such as groundwork, trenches, cable laying or electrical cabinets. Our solutions don’t need any maintenance for the first 10 years. What’s more, by choosing streetlights running on green energy, there’s no more electricity bills. Together, these savings make solar streetlights much more competitive than their conventional, grid-tied counterparts. Today, the return on investment is very quick on some projects and immediate on others. What’s the design life of a solar streetlight? And if there’s a fault, is it backed by a warranty? The components of our off-grid solar streetlights are all designed with durability and performance in mind. Our products are fully covered by a five-year warranty. And the first service isn’t needed until 10 years after installation. - our PV module guarantees optimal power delivery for 25 years. - our LED light unit has a service life of 20 years. - the Power365 battery has a lifespan of 10 years, or 4.000 charge-discharge cycles. In all cases, the Fonroche team is always on hand and guarantees fast after-sales service and support everywhere in the world. Can I control my solar streetlights remotely? Fonroche Connect is a clever new tool for monitoring and managing solar streetlights remotely. Fonroche Lighting teams have designed this connectivity tool to meet the requirements of customers wishing to monitor and control their solar streetlights in real time. 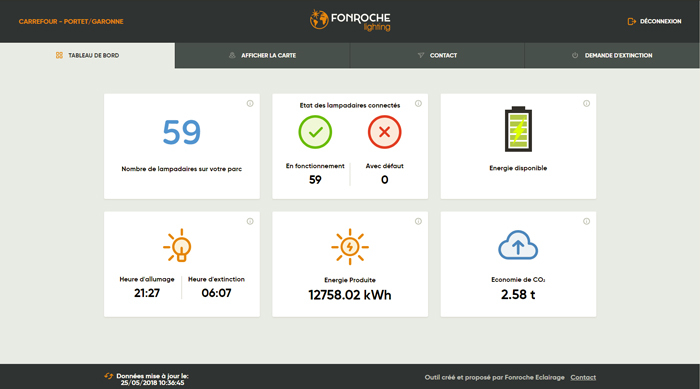 It’s a web-based app specially designed for Fonroche solar solutions and using the LoRa low-data-rate network protocol. Can Fonroche streetlights be recycled? Unlike lead acid and lithium batteries, NiMH batteries don’t contain any heavy or toxic metals. They’re 98% recyclable: the nickel is extracted and used to make various materials, mostly stainless steel. The solar panels have an extremely long service life. Even after 25 years, they’ll still be producing at least 80% of their initial peak power. So they can continue to be used. Alternatively, about 96% of their component materials can be recycled to make new panels. Does my solar streetlight need to be fitted with a motion detector? Fonroche off-grid streetlights aren’t fitted with motion detectors. Constantly switching on and off the LED light unit significantly reduces the battery’s useful life and makes it hard to predict energy consumption with any accuracy. Plus, the detection range of motion detectors is limited (typically between 3 and 12 metres, whereas the distance between streetlights along a road is about 25 metres. So regular sections of road or pavement would still be in the dark!). 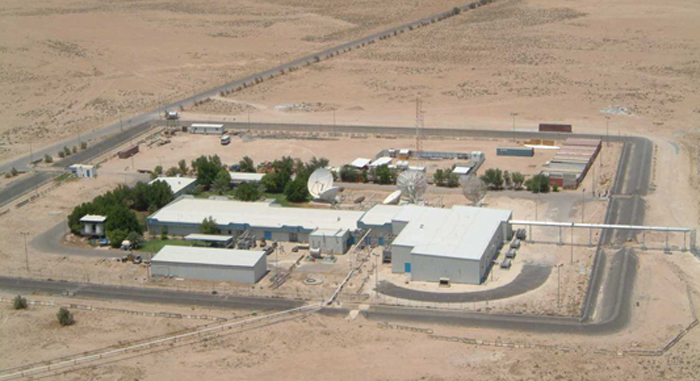 The brilliance of Fonroche solutions lies in our ability to anticipate actual lighting requirements, which are specified by our design teams as part of the photometric and solar surveys they conduct for each project. This right-sizing ensures guaranteed stability of the system and an optimal level of lighting power. For these reasons, motion detectors, with their inherent lack of stability (switching on and off randomly, causing light pollution, etc.) really aren’t compatible with Fonroche solar lighting technology. At Fonroche, delivering powerful, dependable lighting 365 nights a year is our top priority as we constantly seek to meet market requirements. And it’s our proven ability to achieve this that makes us an industry leader today!